Here at SpinningDesigns, we are always designing and innovating the latest technology into our product line to give our customers the best chance in attracting new buyers to their own brand and products. We are now introducing the Motion-Detecting Sound Unit, our newest leap in entertainment technology! Jam-packed with on-board Wi-Fi and able to sync up to any speaker, including via Bluetooth, our Sound Unit can turn any spinning prize wheel into a thrilling, musical game of chance. Adding music to the spin of a prize wheel builds the excitement to a whole new level of fun, and the crowds truly love it! This Sound Unit is sturdy, reliable, and super easy to use! It can be attached behind any wheel, no matter the size. You can even use it on our competitors wheels if you already have one. Drag and drop songs onto the devise via Wi-Fi from any laptop or Wi-Fi ready computer. Then choose which songs should play on spin, play on stop, or simply choose both! Upload over 30 songs and watch the people fill with joy when their favorite song plays next. The Sound Unit connects to speakers though a standard AUX port or via Bluetooth depending on the speaker you have. Once people hear your branded wheel playing music, your company will always stand out in their eyes! Whether it’s having a 48 inch LED Prize Wheel playing music when spun or an enormous 96 inch Triple Wheel turning heads as people walk by, our products are made ensure your company stands out from the rest. This entry was posted in Uncategorized and tagged Motion Sensor, Sound Unit, Technology on August 1, 2016 by spinningDesigns. Spin prize wheels have been around for years and for good reason: they are an easy and safe way to have fun! Today’s prize wheels aren’t just built for game shows, however, they are designed to help motivate employees, drum up excitement at events, or to create enthusiasm and raise money at a fundraiser or charity event. They are popular choices for these and other types of events because they are easy to set up and transport from place to place, and they are always guaranteed to provide tons of fun no matter where you take them. 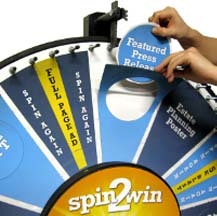 One of the most popular ways to use spin prize wheels is for school fundraisers. Students can sell tickets to other students, parents and members of the community to “win” a spin, and by getting local businesses to donate the prizes, all the money they earn can be put back into school programs. It’s a great way to earn money for band trips, new sports equipment and special events. Spin prize wheels are also great for charity events, auctions, bingo nights and other events where big groups need to be entertained and where there is the chance to make some money for a good cause. Prize wheels are also often used at sales events and at trade shows, where everyone is always vying to have the latest and greatest marketing materials and promo items. Nothing can make a crowd gather faster than a brightly light prize wheel and the chance to win some great prizes. Having a few high-ticket items, such as an iPad or a big gift card, is just one way to increase enthusiasm at your event and is an easy way to get some valuable exposure for your business. No matter how you use your prize, you can rest assured that it will be something that everyone can enjoy. Prize wheels don’t require any special skills or specific educational level to play and they can be enjoyed by people of all ages, shapes and sizes. This entry was posted in Uncategorized and tagged spin prize wheels on January 16, 2014 by Julie. The answer is ABSOLUTELY! We can ship anywhere in the world. In fact, we have! There are Spinning Designs prize wheels in six out of seven continents (and as soon as someone in Antarctica needs a promotional wheel, we’ll ship it there too!) Plus, our shipping experts will go out of their way to find the best method of shipping to match your needs and budget. We know that when shopping internationally, between the costs and the regulations, it can be quite a hassle and sometimes very expensive. We know that maintaining a budget is important in every event. With these aspects in mind, we’ve educated ourselves through experience and communication on all aspects of getting your wheel from us to you as efficiently as possible. Every country is different including variations in documentation, pallet size regulations, weights and even the type of wood used to build crates. Was this shipment fumigated? Do you have exactly six copies of your commercial invoice?? Where is your Free Trade Act Agreement paperwork??? A tad bit overwhelming for a novice? Sure. But for shipping veterans like us, consider it done. When you purchase a wheel through Spinning Designs, you can count on years of experience working with international shipping, contact with the best shipping representatives in the world and a knowledgeable staff who knows exactly what needs to be done. shipments until you get the call to confirm delivery! Our goal is to get the highest-quality prize wheel to your location quickly, safely and with as little fret to you as possible. This way, you can plan your event with ease and have a great time once it arrives! 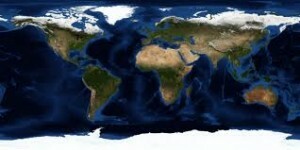 For example, we have tabletop prize wheels all across Australia and the southeast hemisphere. One such company, Cosmic Ticketing, has several locations throughout New Zealand which we have furnished with our wheels for promotional purposes. They are so effective in bringing in customers that they requested one for each branch. Not only do our wheels bring in business, but they’re fun for employees and patrons alike! They are handy enough to sit on your glass counter tops for individual sales purposes or sturdy enough to travel from location to location. 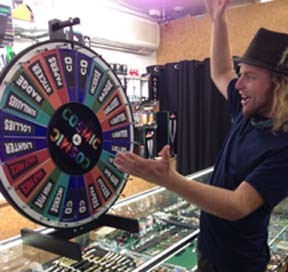 Whatever your needs, a tabletop prize wheel is a limitless addition to your business. Call us anytime to chat about shipping prices. With no obligation, we’ll let you know before you order the shipping costs for whatever sizes you’re thinking about and your location. WANT TO ORDER IN BULK?? You want to order 1,000 wheels for every franchise in the company? No problem! Our people can get you great freight rates by air, sea or a comparison of both! There are also express freight options as well to get your large order there fast. We make large shipments overseas as hassle-free as possible for you and your company! Call us for a full quote and more information! This entry was posted in Uncategorized and tagged international shipping, prize wheel, quantity, tabletop wheel, wheels on January 13, 2014 by spinningDesigns. Party planning is no easy task when you are trying to look for something new and innovative in the area of entertainment. There are always some new trends to take advantage of when it comes to entertaining your guests, but sometimes it’s the old-fashioned things that end up doing the trick better than anything else you could provide. Game wheels, money wheels and all of the fun accessories that go along with them can provide everything you need to create a memorable and entertaining experience and they may be just what you need to liven up your guests. If your friends are tired of the same old party with drinks and apps, then why not spice up their next evening at your house with a night of casino games and festive themed drinks! Create a cocktail party centered around a poker theme, by creating a casino floor in your home, complete with a prize wheel and game table. Set up a few areas for seating and snacking, and turn on some lively music. With just a few decorations and the right lighting, your party area can instantly be transformed into an exciting Vegas-style retreat. It’s a fact that everyone loves to win a prize, and being at a party makes winning it all the more fun. Try setting up a game wheel the next time you are planning a birthday party or bridal shower celebration and notice how easy it is to get everyone involved. You’ll be surprised at how much energy and fun prize wheels can generate, and as an added bonus, you don’t need to have a ton of expensive prizes to make these types of games and giveaways fun. Some simple yet creative prizes are typically all that you need to keep your guests involved and having a great time, and it definitely helps to create a party that they will never forget. This entry was posted in Uncategorized and tagged game wheels on January 9, 2014 by Julie. There’s nothing worse than attending a trade show that has the same old boring booths and tired décor and no hope for fun. Why not jazz up your next trade show appearance with a trade show prize wheel and unique prizes that will have everyone talking? A trade show wheel that is custom designed with your logo and colors won’t just make you stand out during the event, but it will make others remember you long after they have left the event as well. It’s a great way to be memorable and to get others to take notice. If you’ve ever attended any kind of trade show, then you likely remember a few key exhibitors who had a really cool giveaway or a unique contest that stuck out to you. This year, why not make sure that your company is the one that sticks out in people’s minds by offering them something different and new? Having a prize wheel to pull out at a trade show offers something different than the same old activities and promotional giveaways, and it’s sure to get you noticed. When you throw in some bright colors, flashing lights and special touches like oversized wheels or tabletop sizes, prize wheels are truly entertaining. Setting up and transporting a trade show prize wheel is just as easy as setting up any other type of display. You can get a prize wheel that sets up with a wall mount and background, or one that works with a durable floor stand. Add in a heavy-duty case for easy transport and installation at the trade show, and you’ll be ready to go. It couldn’t easier to start injecting energy into your trade show appearances than by using a prize wheel to help people learn about your business while giving them the chance to win great prizes. As an added bonus, when you go with something that is customized with your company logo, you’ll have something that is even more effective and more impactful on those who come to visit your booth. It’s win-win for you and your visitors and is something that you’ll surely appreciate over time. This entry was posted in Uncategorized and tagged trade show prize wheel on January 2, 2014 by Julie. We answer a lot of questions about our Insert Your Own Graphic wheels. It’s the most versatile option we offer, but for some reason it gets lost in translation when it’s on your computer screen. Understandable. Our website is only 2D and when you have a flat image; it’s hard to show the many dimensions of our Insert Your Own Graphic wheels. QUESTION: Are the black and white circles in the picture printed on the section? ANSWER: The circles you see in our pictures are actually the insert holes. We digitally print the graphics and bond them to a magnetic sheet. They are shaped and then a hole is cut right out of the middle using a die cutting press. The custom template we provide will allow you to print out your paper insert and then the magnetic section will hold it to the wheel. Therefore, when your insert is behind the magnet, the portion in the center is what will show. Conclusion: There is a hole cut out of the middle of the section acting as a window (or frame) for your printed insert. QUESTION: Are the magnets flimsy? ANSWER: Our graphics are layered on 30 mil thick magnetic material. This is commercial grade material primarily used on heavy duty commercial vehicles! Not only can they hold printed inserts, but customers have tossed on business cards, gift cards, and even blu ray discs which have stayed put spin after spin after spin. After years of use, you won’t have to worry about these magnets cracking or breaking under the pressure. And you’ll never have to worry about your inserts flying out of its pocket when the wheel is spun like those plastic-faced insert wheels you see on other sites. Conclusion: Actually, they’re really tough. QUESTION: What happens if I lose a section? ANSWER: If you lose a section, give us a call at 732-775-7050 and we will be more than happy to sell you a replacement section without having to purchase the entire set again. We will keep your graphics on file for years to come, so getting the same one that you lost won’t be a hassle. Conclusion: We’ve got it covered. Give us a call. I changed my mind and wanted a special section! Do I have to buy a new wheel? ANSWER: Our designers can create new graphics based on your peg count. Adding more sections, changing color schemes, or changing the shape of the insert hole; it can all be done. Our graphic’s team can create a whole new wheel based on just size and peg count. Conclusion: We’ve still got it covered. Call us for a new pre-sales rendition. And the BIGGEST QUESTION of all: These are more expensive than other sites. Is it worth the cost? ANSWER: The major reason for purchasing this wheel over the others is that you can use it over and over and over. It has room to change and adapt to be used at any event. Staff Incentive? Print out inserts. Tradeshow? Print out new inserts. Christmas party? Birthday Party? Charity event!?! Print out new inserts!!! Since you can make them on a whim at any computer and printer, you can change your prizes anytime you want and it will still be printed and professional. It’s like having a hundred prize wheels in one! Overtime, your marketing department will be able to use this piece of equipment to build a foundation and clientele for years to come with endless possibilities. Conclusion: They’re worth every penny. This entry was posted in Uncategorized and tagged custom, insert wheel, magnetic prize wheel, trade show giveaways on December 30, 2013 by spinningDesigns. If you job involves event planning for crowds large and small than you have likely found yourself wondering how to impress your clientele with fun events that are chock-full of entertaining activities and rewarding experiences. Promotional wheels are one easy way to spice up any occasion, including even the most mundane trade show or boring business meeting. Whether you are looking to entertain a crowd of 500 or a small group of 30 individuals, promo wheel can provide the unique entertainment that you’ve been looking for and they are much more affordable than you think. Promotional wheels, or prize wheels, have long been recognized on game shows and in contest settings on television and at other large venues. However, today’s event planning professionals now utilize prize wheels for a variety of occasions. Sales meetings, holiday celebrations and other company functions all over the country are now more fun because of promotional wheels – and employees are happier too because they get the chance to win great prizes while having fun with their peers. If you are planning on using a promotional wheel at your next event or work function, you’ll first need to come up with a game. Are you looking for something that includes an educational component or are you simply looking to give away prizes? This will determine how spins will be allotted and what type of wheel you will need, so be sure to consider it carefully before choosing your wheel. The best part about using promo wheels is that you don’t have to bring in a giant wheel just to enjoy the fun in an office setting. Prize wheels come in all shapes, sizes, colors and designs so that you can get exactly what you want. It’s a truly easy way to pump up your next event with something fun and unexpected, so check out what a prize wheel can offer your company today. You’ll be surprised at what adding a little bit of unexpected fun can do for your business. This entry was posted in Uncategorized and tagged promotional wheels on December 26, 2013 by Julie. Prize Wheel of the Week – FLG LACROSSE! Congratulations to FLG Lacrosse for being chosen as our Prize Wheel of the Week! 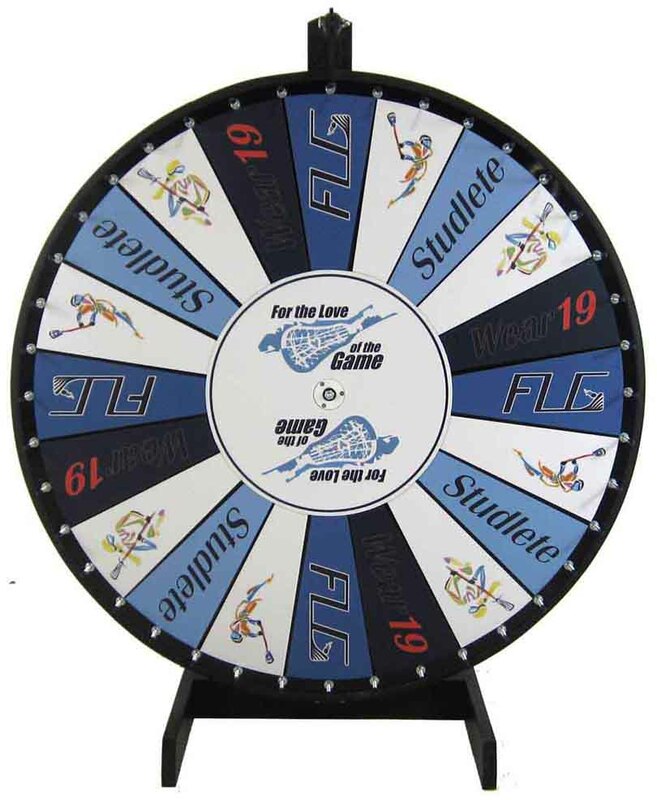 When FLG Lacrosse prepared for the upcoming convention, they decided a prize wheel was a back door shot! What better way for supporters to win gifts and giveaways and make an impression! …which lead me straight to look up their website and find out more about their organization! Check out their community service involvement, including how they walked to raise over $1,700.00 for St. Jude’s Children’s Hospital! Hopefully in the future, our wheels will help them earn even more for their charities! FLG Lacrosse presents camps, clinics and teams which expand their students’ knowledge of the game through training, exposure to all styles of lacrosse, and teachings of the rules and regulations. Endlessly supportive, they also provide SAT and ACT tutors for their students as well as create personal profiles for each and every player. At SpinningDesigns, Inc., we fully understand the importance of a company working together to get a job done. Each department performs their day to day tasks, each different but just as important, because that’s how a company becomes resourceful and successful. FLG Lacrosse helps each of their students acquire the same values; being well-rounded and successful in all their endeavors. Here is some more information about FLG Lacrosse and their upcoming events! The For the Love of the Game (FLG Lacrosse) is committed to building well-rounded, student – athletes that excel on the field, in the classroom and in their communities. Through lacrosse, FLG teaches its members valuable skills, such as leadership, teamwork, friendship and a good work ethic, that are important in every aspect of life. FLG players are also taught the importance of giving back, partaking in various charity, Mentoring and Community Service. Since its inception in 2007, the FLG organization has successfully used lacrosse as a tool to build more than just athletes. Two of the country’s premier lacrosse clubs have joined forces to present FLG in 3D Recruiting Tournaments (Summer & Fall Showcases). Top club teams from different regions of the country spend a weekend competing against each other in a high level tournament that includes coaches from Divisions I, II and III, All-Star Games in each division, vendor village – all in a quality tournament set in beautiful surroundings. We are very proud to have been chosen by FLG Lacrosse to create their one-of-a-kind custom magnetic prize wheel. Spinning Designs, Inc. wished them luck in all their future endeavors! This entry was posted in Uncategorized and tagged custom prize wheel, FLG Lacrosse, SpinningDesigns on December 16, 2013 by spinningDesigns. Are you tired of doing the same old routine at every tradeshow and are looking for a new way to draw customers in? If you are like most salespeople, then you’ve probably got the whole process down by now and are set in your routine. You’ve got the outdated brochures on the table, the cheap pens with your logo and your worn out booth that does nothing to draw attention. Isn’t it time to wow your customers and draw them in in with a custom LED lighted prize wheel and some great prizes? Prize wheels have been around for a long time with great success, however, the latest models are nothing like they used to be. It’s hard to find something for a trade show that gets attention more than a largely, brightly lit LED prize wheel that is customized with your logo and colors. Instead of walking right by your boring same-old marketing materials, a prize wheel can bring a level of excitement to your company in a way that nothing else can. You don’t have to spend a lot on prizes, and you’ll be giving potential clients and customers a memorable experience, which is a big positive for your business. One of the best things about LED prize wheels is that they are incredibly versatile and can be programmed to include any type of message, making it easy to reuse them over and over again. When you need something unique, fun and exciting for your next trade show, an LED prize wheel makes it easy to get your message across in a big way. Simply give people raffle tickets or have them donate to a local charity for a chance to play, and let them take a spin on the game-show style prize wheel. The thrill of the play and the excitement that it generates will definitely have people coming by to see what you’ve got to offer. Don’t let you next trade show go by without taking full advantage of your marketing options. Instead of wasting money on the same brochures and printed collateral, invest your marketing budget in a new LED prize wheel and some fun and memorable prizes. Trade show attendees will appreciate and remember your creativity, while you’ll be able to take advantage of the increased exposure. This entry was posted in Uncategorized and tagged LED lighted prize wheels on December 12, 2013 by Julie.